Sheri Schjolberg, Principal of Danforth Elementary knew that the school’s playground was falling into major disrepair. She also knew that the Riverview Gardens school district did not have funds in their budget for a new playground. A committed volunteer saw the local news story covering Play 4 ALL’s work in Ferguson, Missouri and their new Healing Communities Through Play™ initiative. One phone call and all the pieces fell into place. St. Louis City and County police officers stepped up immediately and funds began to come in slated for a new playground. Pleasantly surprised, one St. Louis family gifted $75,000. The Community Build happened on July 21st, 2017, one of the hottest days of summer. 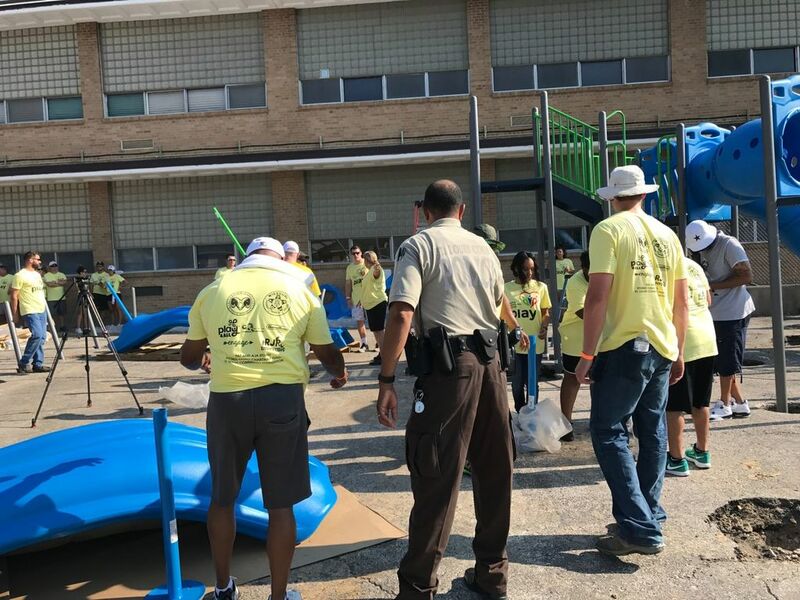 With temps reaching over 104 degrees, over 140 volunteers flooded in to make sure a new playground welcomed the Danforth students back to school the following month. Helping do the heavy lifting, River View Gardens Varsity and Jr. Varsity football team joined the officers and community volunteers. “It’s a day that I will never forget” said an officer that was recently wounded while on duty. “There is so much good in the world”.